SIMPLE INSTALLATION - PREFORMATED INTERFACE - 100 updates /sec. The high speed F158 weigh controller is designed to provide efficient production control functions in a wide variety of applications. The PLC mounting configuration simplifies the wiring and start up time for the system integrator / developer. As a weighing module the F 158 uses its high speed (10 mS response) to provide quick response in your weighing application. The F158's power supply can excite / power up to four 350 ohm load cells (or eight 1000 ohm). Applications can include: hopper scales, packing scales, bag filling, and others systems that require high speed and accuracy. Strain gage sensors can be connected directly to the F158 and a 5V excitation voltage provides the power for the strain gauges in your application. Span, Zero, and other calibration functions can be configured through PLC programming, or alternately, a small optional calibration tool (the C110 or C120 numeric keypad) can be plugged into the front of the F158 weight module for simplified calibration and setup. Set points with a wide variety of control functions can be set up in the F158 ? 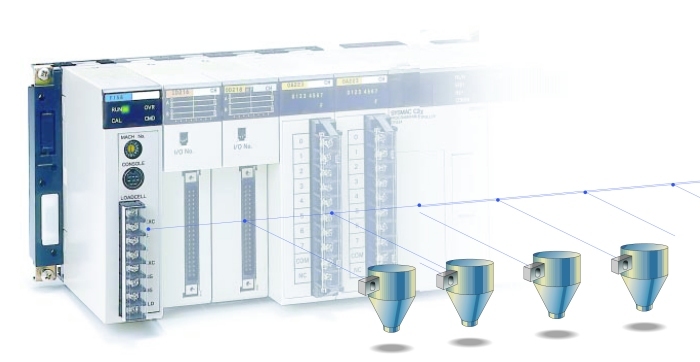 this frees up the PLC work load by establishing a mini weighing station to manipulate to strain gages sensors and relays - and then transmit only finished data to the PLC itself. Auto free fall compensation, fast, slow and dribble fill modes (SP1, SP2, SP3, and FINAL settings), timers, and HI/LO limits are all set point functions built into the F158. The system accuracy (non-linearity) is 1 part in 10,000 divisions (0.01% full scale). Calibration is simple, and special situations like system dead load (mounting plates, hoppers, etc.) can be compensated for by a front panel entry. Communication setup protocols are available for both the C200H and CS1 OMRON PLC's. Machine number starting address locations are simple to enter thru a rotary switch on the front of the F158 module. Finally the F158 has a locking mechanism on the rear panel to prevent accidental changes from being made after system setup.